The organizers of the Ironman 70.3 Ohio trust one group for communication, the Amateur Radio Emergency Service. Rooks said ARES supplies safety personnel from the city and county with live video of Delaware Lake’s beach and points along East William Street. He said the video is transmitted via WIFI on a MESH network, a private internet for amateur radio, to a large screen in the Ironman Operations Center at the Meek Aquatics and Recreation Center on the Ohio Wesleyan University campus. Members of the Delaware ARES come from the membership of Delaware Amateur Radio Association. Rooks said this year the Ironman organizers and the city really “ramped up” the event. Rooks said this year the group had 18 radio and three video operators at several points of the course with a control station for the entire network at the Red Cross building on Hills-Miller Road. Rooks said ARES has been involved with emergency services since the 1930s. He said the Delaware ARES is the backup for the Delaware County Emergency Management Agency’s communication system. Now retired and full of ideas, ARES member Bob Dixon discovered a way to get live video of the course. Dixon was the assistant director of The Ohio State University Radio Observatory, dubbed the Big Ear. 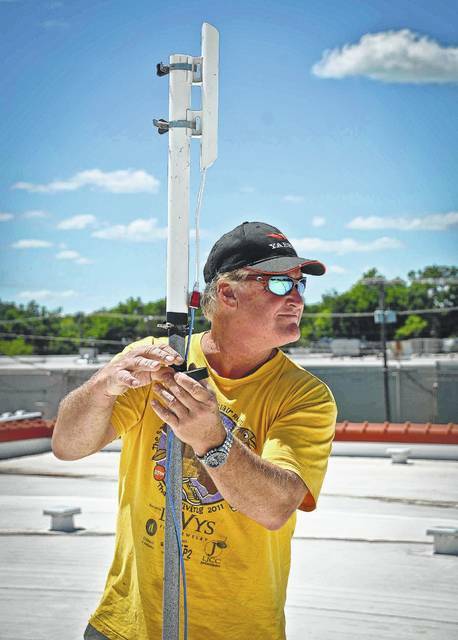 “It’s how amateur radio got to where it is today,” said Rooks. According to Rooks, Dixon started the first ARES in Columbus years ago. Dixon said MESH isn’t an acronym. It simple describes the technique they use to develop the system. Dixon said it is the same technology as regular radio, just a different application. Rooks said the Delaware Amateur Radio Association is free to join and they will help anyone who is interested in amateur radio to get a license. “There are no dues, but you get to work for free,” he said. This entry was tagged Ametuer Radio, ARES, DELARA, HAM. Bookmark the permalink.